Gardeners, Garden Designers and Their Role in Saving the World! 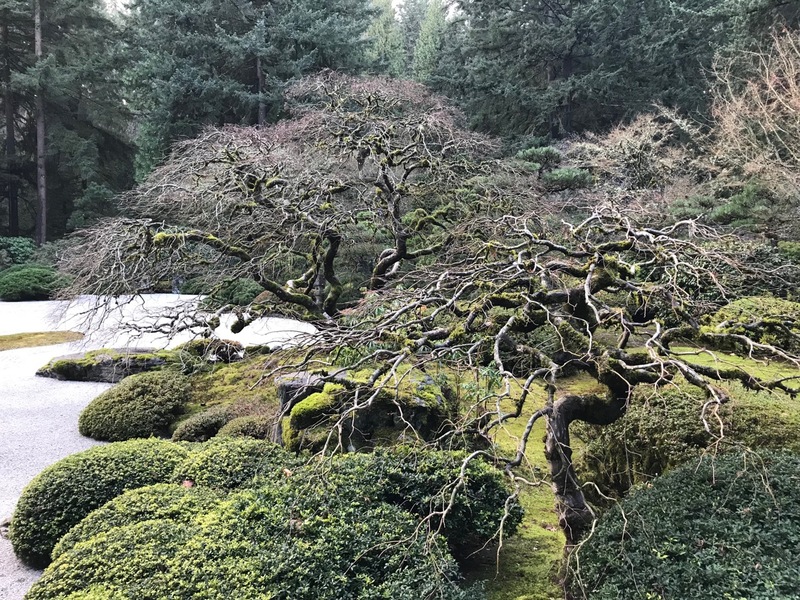 The Portland Japanese Garden, two well shaped Acer palmatum. To prune this way takes time, attention and an understanding of how your subject grows and how it will respond to your cuts. This is generally true of the garden as a whole, how it as a whole will respond to your management and changes. It requires an understanding of the plants themselves, the site conditions and how they function together. Loree, of Danger Garden, posted a comment and a link in Facebook a few weeks ago, to a story about a gardener in Australia and what gardening meant to him in the online Planthunter blog. It elicited an array of comments, both supportive and not. She posed the question, are the ‘best’ gardens the products of an ‘organic’ process, produced by the gardeners themselves, in intimate relationship with their place? Which raised the question, can garden designers create truly beautiful gardens for others on landscapes that they don’t have this personal connection to? Her question caused a flurry of comments, several containing a lot of emotion. Loree’s simple question produced a fair amount of ‘heat’. I found the array of responses, and the conflicts they brought to light, provocative and I think a lot of that heat comes from the fact that our modern society has become largely estranged from the natural living world. I spent quit a bit of time thinking about it. Below is what it prompted in me. I retired from Parks after a career of mostly fixing and tweaking designs that I had nothing to do with, but ended up resposnisble for, tearing out neglected landscapes that had became grossly overwhelmed and out of balance by overplanted and aggressive plants, others that were lost to weeds and invasives, others still that were stomped out and abused by the public largely because of their siting and the public uses which they had to endure, a public that is often indifferent to the living world and its requirements and their resulting traffic patterns that designers thought that their massing could channel where they wanted. I did this while working within an organization that undervalued the plants and the horticulturists who cared for them….I was still able to create a few places that the public responded to positively. After retiring a couple friends designed business cards for me and I thought I would add my own ‘shingle’ to the garden designers out there, but it didn’t work. I quickly realized that though I value my friends and social contacts, I am not equipped to work with people this way. Producing beautiful spaces for clients requires an artistic sense, which I have, an understanding of space and how people live and move within it, which as a long time observer I feel i have as well, a broad and deep understanding of plants that includes their aesthetic value but goes well beyond this including their relationships with those plants they share space with and the conditions on the sites themselves, something, hopefully as gardeners we all develop…and the ability to read and respond to the peculiarities and interests of the client, a skill that has remained undeveloped in me. I don’t really get people…which is why I got into plants to begin with. I do understand that people will ‘respond’ to beautiful spaces, I used to see it every day in Parks, and that they may want to live within them, but I don’t think that many of them really understand what that means, what it takes to create and sustain such places and I never really figured out how to bridge that gap. Just as people don’t seem to understand how ugly, neglected, abused and poorly cared for landscapes and ‘waste spaces’ detract not only from the natural world, but from each of our own individual lives, they don’t seen to understand the role of beauty and the natural world in their own lives…how it’s absolutely essential to healthy human and community life. We seem to view nature and beautiful landscapes as luxuries, that only after we have met our basic needs, can we then consider adding back into our own lives….Beauty and health are intimately linked. They do not exist without each other, yet today they are, in a sense, outside of our everyday reality. Our lives are outside of the natural world. Our way of life is in conflict with nature. The natural world and beauty has, in our modern world view, become secondary. First, we must make for ourselves a life and secure it…only then will we begin to consider the natural/living world. Nature has become an ‘elective’. 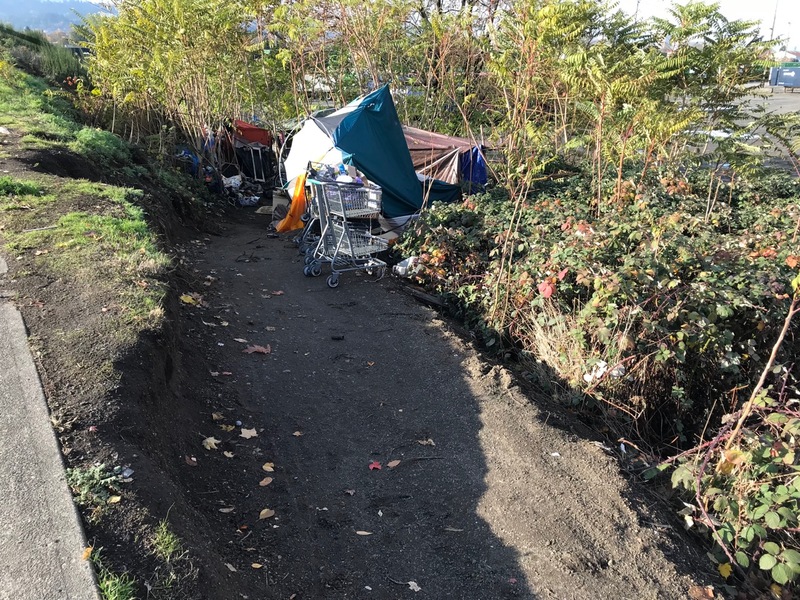 This is a homeless camp adjacent to the NE approach to the SE Holgate overpass…a waste space. It is minimally ‘managed’ as a low value landscape by the City Department of Transportation, which translates to maybe once a year having part or all of the site sprayed or chopped down with a side-arm mower. Trash is never removed. This is along a common route for me so I have observed the site’s continuing decline as more aggressive weeds and invasives gradually move on to the site due to its location and mismanagement adding to the trash problem. It is dominated by Trees of Heaven, Scots Broom and Blackberry with many common herbaceous weeds and virtually no natives. The homeless have gravitated here to benefit from the same neglect, security and ‘invisibility’ the site provides the weeds, both on their own, languishing, playing our their futures as best they can. No accommodation has been made for them in terms of sanitation, water or shelter so they have improvised adding to the general degradation of conditions which includes the cutting of a path to their site, without reinforcement, which will speed erosion and compound the weed problem. It should not come as a surprise that such sites become a refuge for the homeless, neither are valued. The original ‘design’ of the space gave no consideration for the life that inhabits it, one way or another. The conditions that exist here are all too common in the City. Gardeners and garden designers don’t fit into the necessary framework of most people’s world…and because of this, the skills and values that go with them are held by a minority of citizens. Having a ‘green thumb’ has become an oddity, an archaic skill. What goes along with this are the ‘brown thumbs’ and the expectation that a dead world flows from the hands of so many others….This is the world that we live in today. Gardens and beautiful landscapes, nature and the diversity of life itself that it supports, have become more and more the exception, especially in urban areas, but not just there. As a people we don’t generally recognize our role and responsibility in this. And, it is not just the population that suffers from this disassociative thinking, our many institutions and governments do as well. Each of these have their missions, their purposes, and most of the time the land and landscapes they are responsible for are very far down on their list of priorities. Garden designers, for me, have a larger role, beyond creating beautiful spaces for their clients and that is as mentors and educators spreading the ‘gospel’ of gardening, the stories of plants and their essential relationship with life on this planet. We cannot afford to have gardens which are merely ‘beautiful’. They must call us back. Our gardens are another way for us to access the world of nature, a way not readily available to non-gardeners unless someone is there to mentor them, to begin to teach them the language of life. If beautiful ornamental landscapes and gardens give viewers pause to consider the crises we have put the natural world into, and awaken them to their woeful state in our cities and so many communities and places we pass through, then good. Gardens can become their path of understanding to a more responsible relationship with the natural world…even better. Our gardens and landscapes are more than simple backdrops to our activities, their beauty and health are barometers of our relationship with the living world. Our cities and towns, the countless places we visit and utilize, the wider world and the systems that link them together, are in an increasingly desperate state, a state so out of balance that they can’t return without our informed and commited work. So many people today lack the vocabulary to see the extent of the problem, what our role has been as contributors to it, the absolute necessity for each of us to take responsibility for our own impacts in this and act both ‘rightly’ and honestly to do what we can. When we garden we begin to see these things, the place of nature and our role in it. We begin to understand that much of what is required of us is to simply ‘listen’ and stop doing the things that contribute to the destruction. So often these days we don’t see this. We don’t recognize that if we change the decisions which guide us, if we stop doing the things that are destructive or disruptive, if we keep our eye on the health of an organism or a system and ask what contributes to it, then we may find that small changes can make drastic differences. But first, we have to stop doing that which undermines the health and stability of a landscape…and, to do this we need to have the ‘vocabulary’ to help us see and understand the living world upon which all of us depend. Gardening and our gardens can do this. I would ask that we see passed our differences, which are the best gardens and who are the best designers and take up the mantle of advocate, mentor and activist in the larger cause of life, health and the beauty that flows directly from it. Beauty may be the lure, but life is the larger goal. It is also important that we don’t become confused by the fashionable, because that will continuously change, distract us by its surface, leave us anxious and dissatisfied and perpetuate a continuous, and unnecessary, cycle of change, a change that comes form outside the place itself. Beauty can set us on a course to recreate the integrity, complexity, health, balance and vibrancy of life which is at its heart. I am talking about changing this world. While singular places of beauty can provide a necessary respite and refuge, what we really need to do is share this understanding and provide each other with the confidence to take action and allow beauty back into our world as a necessary and integral part of it. Beauty flows from the natural processes of life. When it doesn’t it is because we have disrupted those very processes and, if we are honest, we have to see that. 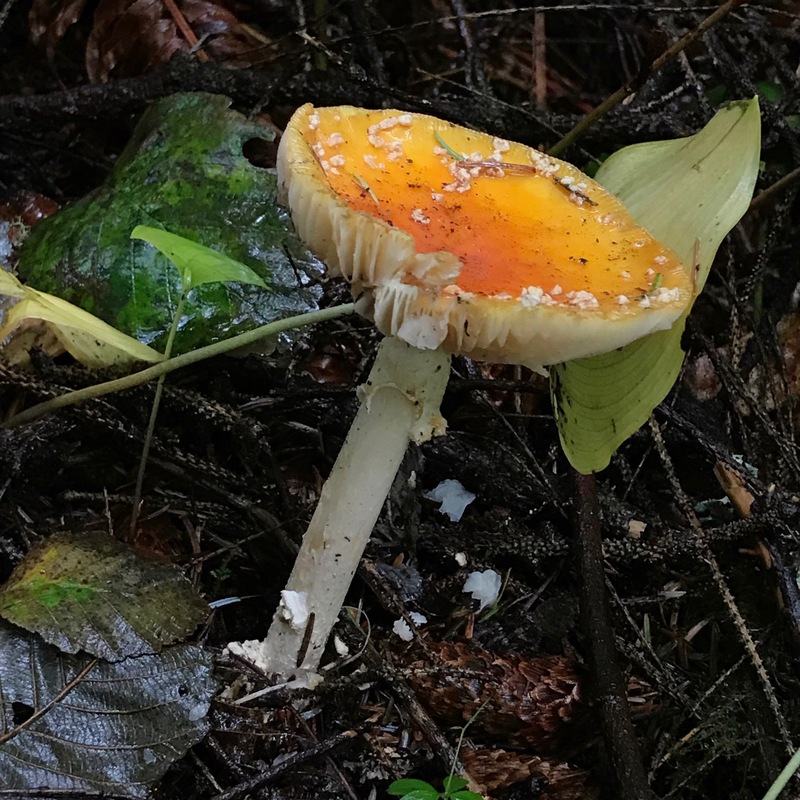 This unidentified mushroom is part of a very complex community that inhabits the ground level of the Oregon Coast Range community. The complexity of these communities insures their continuation, each member fulfilling a very necessary role in holding and cycling nutrients, supporting some members while acting as a deterrent to those that might be taking excessive resources. 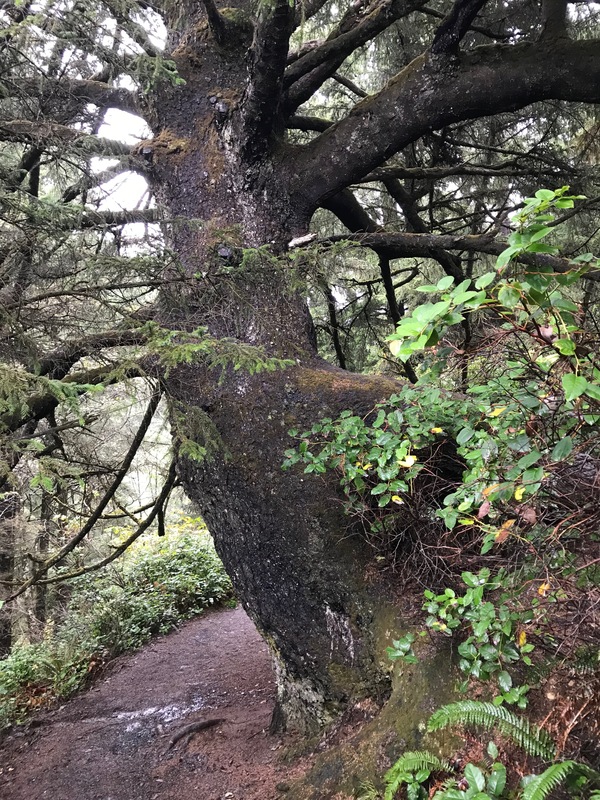 It is an intricate dance, each playing an essential role decomposers alongside those adding to the overall and complex biomass..
A Sitka Spruce, one of the climax species of the Coast Range forest community, looming out over the trail at Cape Perpetua amidst a mix of Salal, Sword Ferns and the rest of the native community, above and below the soil. More mushrooms growing from a wet bank covered in lycopodium every surface covered with living organisms. 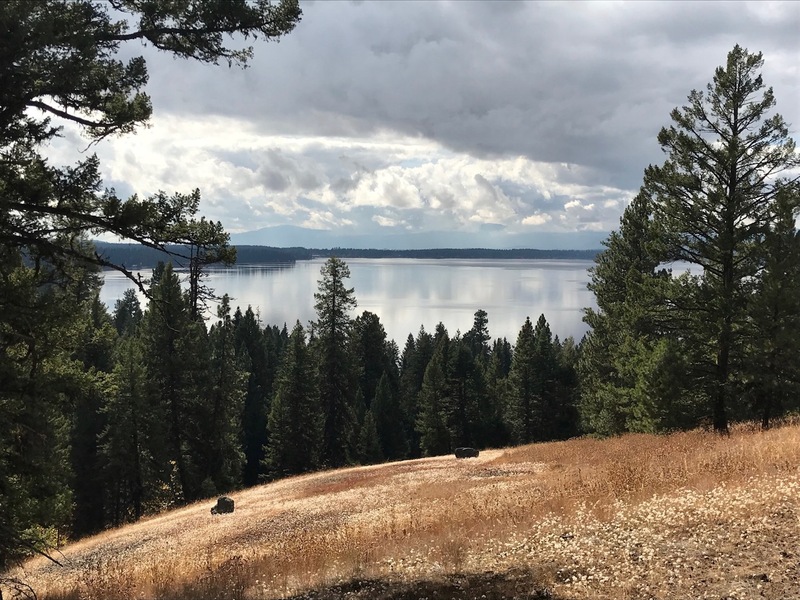 A view of Payette Lake in Idaho from a hilltop on the peninsula in Ponderosa State Park. Native landscapes are intimately tied to their sites and the conditions upon them. 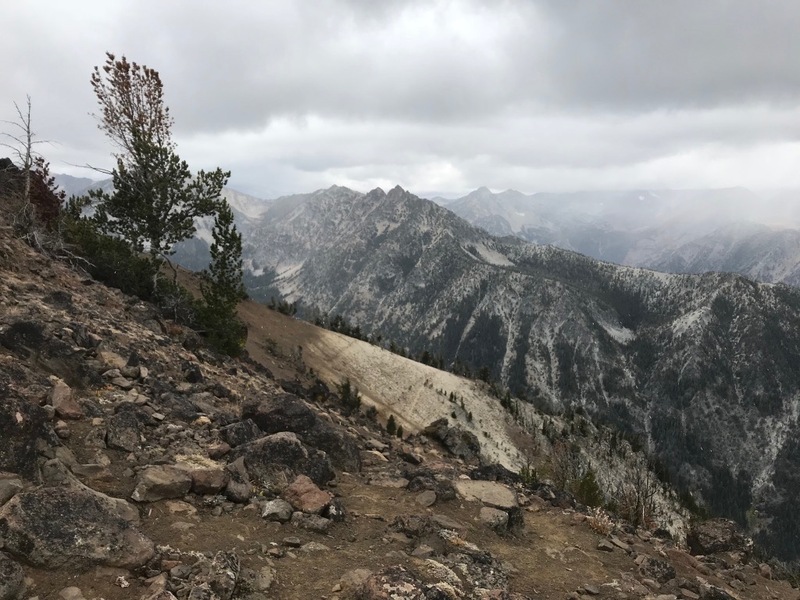 A late September hike on the climber’s trail following the ridge up to East Peak in eastern Oregon’s Eagle Cap Wilderness. Alpine sites like this, while looking barren are never the less responsive and alive. 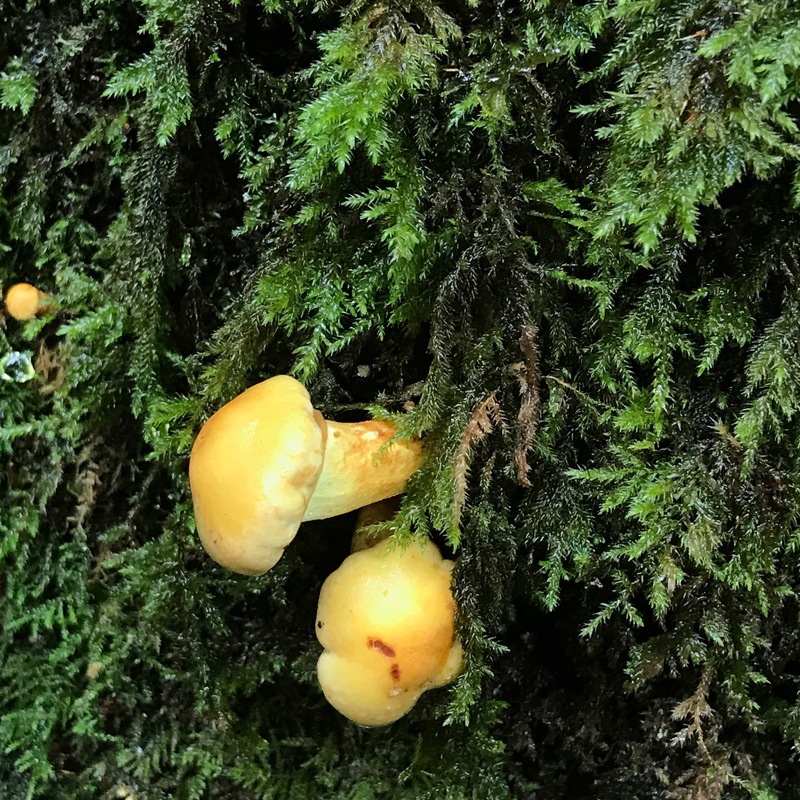 This is a difficult environment for plants, but many tiny species still find a niche in this country’s abbreviated growing season. Up here scattered Pinus contorta cling to the wind blown ridges surviving at elevation well above the Abies lasiocarpa and Picea englemannii. 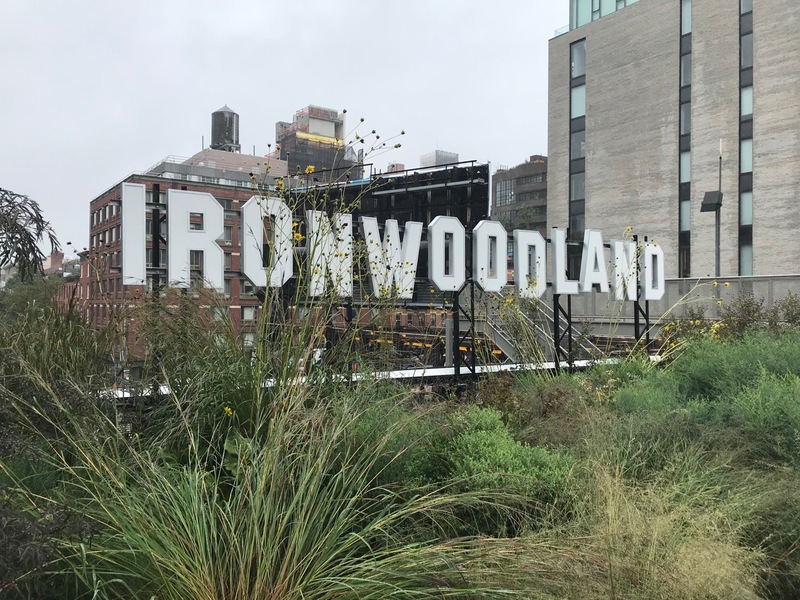 Walking the Highline in New York City’s Midtown, an entirely ‘manmade’ site atop the abandoned elevated freight train tracks, the designers attempted to mimic the ruderal landscapes that came to occupy this long strip with abandonment. The northern portion of the Highline is composed of ruderal species. The rest is planted with much more ornamental species and requires a great deal of regular maintenance. 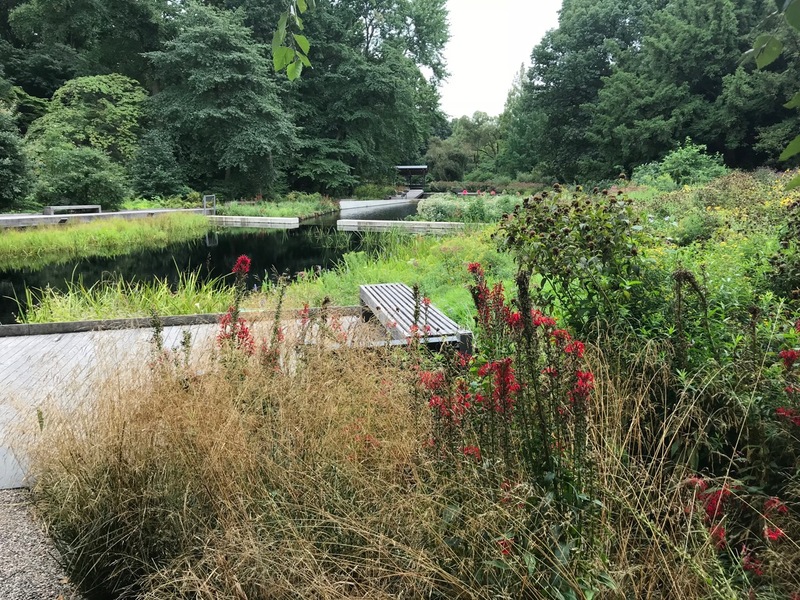 A view of the beautiful native garden in the New York Botanical Garden, the Bronx designers taking their cues from the glacier scoured site. This entry was posted in Design, Garden Design, Horticulture, Landscapes, Sustainable Landscapes on December 6, 2018 by gardenriots. Lance—yes, yes, yes, and yes. Too bad I can’t see Loree’s post any more—I would have loved to read the discussion. It is a viable question. CAN meaningful and/or successful landscapes be created & maintained by people who don’t garden/ don’t have a personal connection to the garden? I know this: no landscape can be successful just from one original drawing done at a single point in time. It is a jumping off point and no more. Yes, there is quality design, installation, and maintenance—the mechanics of these things. (They are extremely important!) But perhaps the most important ingredient of all is a love. Do you care? Does anyone care? The caring—the love—is the most important part. And in this way, I call it spiritual. (“God is love.”) If there is to be a change, it needs to be a cultural shift across the people. Can this change happen? To believe it is a leap at a spiritual level. Now I’m almost regretting that I deleted my post and all the comments, I would have liked to link to this. Why did I delete? I had no less then three heartfelt—face to face—conversations with people whom I admire, who really missed the point of my post and what I was trying to say. Was it really that offensive? I don’t think so, but the fact it was being so misunderstood was cause for concern. I tried to write a postscript explanation but it just sounded like pathetic excuses. I was wondering why I couldn’t find it anymore!